Rereading my last blog I notice that I started with a negative statement about the challenge of my job. So this time I thought I’d start with the positives, and I’m excited to say there have been plenty of them in the last few months. 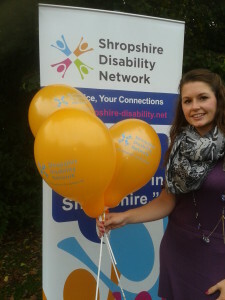 Firstly we are e xcited to have appointed Jessica Lightwood into the newly created Shropshire Inclusion Officer post. This post came about from a successful joint bid to the Big Lottery which was featured in the last edition of Your Voice. Jess is due to start work on the 4th Nov and we hope to featured here future plans in a future edition of “YourVoice”. Secondly, one of the SDN Gold Challenge teams has successful reached the 2014 milestone and SDN Vic’s Victors have just over 100kms to go. Please continue to support the teams through support and donations. I’ve previously talked about the DART which is an initiative started by the Young Health champions. They have now widened the age bracket out to all ages, so everyone from SDN is welcome to join the timed walk around the Dingle starting at 9am every Saturday. It would be excellent if we could get a group of SDN members taking part regularly. After all, taking part in activities like this can lead to improved mental and physical well-being and the evidence consistently identified 150 minutes of moderate intensity physical activity per week as providing substantial benefits for the prevention of numerous chronic diseases, including coronary heart disease, stroke, type 2 diabetes, depression, dementia and loss of physical function. Engaging in the right type of physical activity carries very low health and safety risks for older adults. In contrast, the risks of poor health as a result of inactivity are very high. Older adults should aim to be active daily. Over a week, activity should add up to at least 150 minutes (2½ hours) of moderate intensity activity in bouts of 10 minutes or more – one way to approach this is to do 30 minutes on at least 5 days a week. However, the evidence suggests that it is the overall volume of activity that is key to the beneficial effects of physical activity rather than specific types of activity or combinations of intensity or frequency. Accordingly, adults should aim to achieve the recommended amount of activity in a manner that is most convenient and comfortable for them. Remembering that what each of us defines as physical activity can be very different. This entry was posted in Blog on October 17, 2014 by penval.